Pizza boxes are mostly made of corrugated cardboard, a material that gets the recycling go-ahead in most places. But if you’re just dumping the entire empty box in the recycling bin after you’ve finished your pie, you’re harming more than than you’re helping. That’s because once pizza grease and toppings touch the box, the greasy pieces can’t be recycled and can in fact contaminate other cardboard and paper pulp. According to Stanford University’s recycling guidelines, “Once soiled, the paper cannot be recycled because the paper fibers will not be able to be separated from the oils during the pulping process. 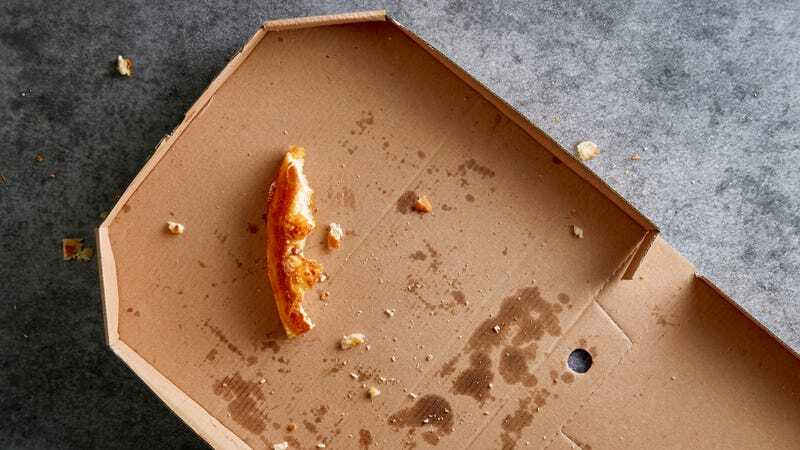 Food is a major source of contamination in paper recycling.” A New York Times guide to recycling states that “a few crumbs” don’t render a pizza box trash, but that once grease sinks into the paper, it can’t be recycled. But there are some ways to save all or part of that pizza box from the landfill: If the top half of the box isn’t greasy, then you can rip that piece off and put it in your recycling bin. Or you can get really green and compost the whole box, a la this new program at Central Michigan University. The campus’ dorms now have a designated space for empty pizza boxes next to the regular trash and recycling containers; it was implemented specifically because so many greasy pizza boxes were ending up in the trash. So, how do you know whether a pizza box is too greasy to recycle? Err on the side of not recycling it, because as Serious Eats explains, that one greasy box can ruin an entire batch of paper recycling. What can I make with leftover bread?